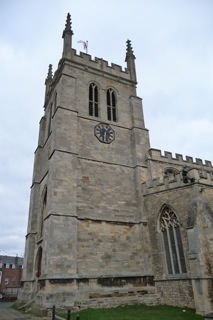 When Fulk Pagnell and his wife Beatrix gave Newport Pagnell Parish Church to the monks at St. Mary's Priory at Tickford in 1100, there was probably a wooden structure on the present site, but it was soon replaced by a stone cruciform building with a central tower. About 1350, the church was rebuilt in its present form, with north and south aisles and porches but without a tower. The chancel was rebuilt during the early sixteenth century, and the present west tower was built in 1542-8. During a restoration in 1827, the south aisle was rebuilt and crockets and battlements were added to the tower and the roof, respectively. New vestries were built onto the north-east corner in 1905, and there was extensive restoration of the tower in 1972-3 and of the exterior stonework and roof in 1989-93. Whether approaching the town from either north or south, there is a fine view of this cathedral-like Church. It stands above the valleys of two rivers - the Great Ouse and the Ousel or Lovat. At the time of the Norman Conquest, the town was known as Newport. In the reign of William Rufus, the owner of the Manor, Fulk Paganel, added his name. He founded the Priory of Tickford and gave Newport Church to the Prior and Monks, together with a "hide of land in the Field of Newport". The Priory was dissolved by Wolsey in 1524and much of its endowment was given to Christ Church, Oxford. Newport was originally in the Diocese of Dorchester under St Birinus. In 1072 it was transferred to Lincoln, and finally in 1845, was moved to the Diocese of Oxford, where it still remains. The town has been part of the deanery to which it gives its name since the 13th century. Nothing remains of the original Church but it was probably a simple Norman structure, of a nave and chancel. Later, there is thought to have been a cruciform Church on the site, with nave, central tower and transepts, but in the 14 century, the tower was destroyed, and records show a new one was built on to the west of the nave about 1540. The pinnacles and battlements were added to the Church in the great restoration of 1827. We enter by the North door through the porch, with a room above it. This is one of the earliest parts of the Church, dating from about 1350. The South porch is of the same period and was restored in 1951. The font is a copy of the Norman one in Aylesbury Parish Church. The tower is of three stages, strengthened by clasping buttresses, and is surmounted by an embattled parapet with pinnacles at the angles and at the centre of each face. The west doorway has a pointed head and continuous mouldings. Above it is a four-light window with modern tracery under a four-centred head. Access to the upper stages is provided by a doorway on the east side of the tower leading from the nave roof, the roof being gained by the turret stairway at the south-east of the nave. The bellchamber is lighted on each side by two tall windows, each of two trefoiled lights under a pointed head. All this work has been considerably restored, and the parapet and pinnacles are modern. eight bells, a small bell by Anthony Chandler, inscribed 'A.C. 1671,' and a clock bell, added with the chiming apparatus in 1887. Five of the ring were recast in 1749 by Thomas Lester of London, one was added in 1769, one in 1816, and one in 1819, but the whole ring was again recast in 1911. Note the splendid length of the nave, the roof - the great treasures of the Church. The roof was found to be badly damaged by the deathwatch beetle in 1934 and had to be rebuilt. Some of the wooden figures supporting the main beam can be identified as apostles. The roof was decorated during 1967 when the interior of the building was cleaned and redecorated. The clerestory was built in the 15 century. 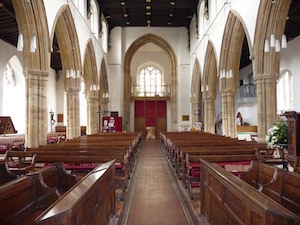 In 1827 the whole of the South aisle was rebuilt. The threefold sedilia, now in this aisle, dates from the early 14th century, and was probably originally in the Chancel. Above the sedilia is a marble wall memorial to John Revis, who built and endowed the row of almshouses close to the Church, in 1763. Note the brass figure of the civilian, fixed to the turret door, and dating from 1440. 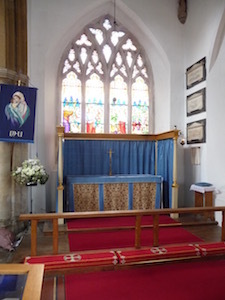 The Chancel screen was erected in 1870. The pulpit was given in 1871, and the modern oak lectern in 1933. 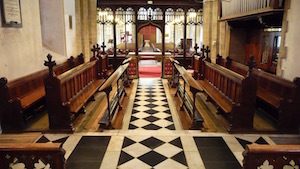 References to various alters occur before the Reformation, but it was not until 1933 that the present Lady Chapel was restored in the South aisle, and then the Chapel of the Transfiguration in the North aisle in the following year. These Chapels were refurbished with oak flooring and new Communion Rails in 1957-8. Galleries, dating from 1710, were removed in 1926, when electric light was installed. Two standard candlesticks were made from the old timbers and are used for the Pascal Candles. Rewiring and new lights were installed in 1959-60. The chancel was newly roofed and paved in marble in 1894. Note the piscina on the South wall, by the High Altar, and also the memorial slab on the opposite wall in the 17th century, to Sir Richard Adkins, descended from Dr Henry Adkins, the Royal Physician, who owned the Tickford Abbey Estate. The Reredos, given in 1894, consists of three hand-painted panels. The original organ, built in 1665, was replaced in 1867 with a Henry Willis instrument, which was enlarged in 1905. There is no ancient stained glass now in the Church, but the West Window in the tower is a memorial to the first Bishop of Oxford, Bishop Wilberforce. The Registers go back to 1558, but are now held in the County Archives at Aylesbury. A list of Vicars dates from the 13th century, the first one, Henry, having been instituted in 1236.